^ Student enrollment for the 2010-2011 academic year. 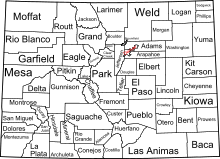 ^ "Colorado School Districts/Buildings and Personnel" (PDF). Colorado School District Directory. Colorado Department of Education. 2010–2011. Archived from the original ( pdf) on December 25, 2010. Retrieved February 2, 2011.